Call 706-374-0710 for a FREE quote. Put our years of promotional and advertising experience to work for you! An additional $80 non-refundable artwork charge must be paid before work can begin. If acceptable artwork cannot be provided, additional art charges may apply. For other Standard Imprint Color (Black, Red PMS 200 or Green PMS 334), add $20.00 per order. For Custom Imprint Color, provide PMS # and add $85.00 per order. 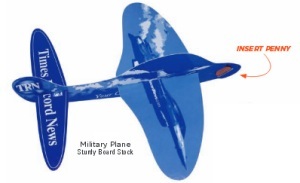 Tail surfaces and pilot figure are preprinted and remain in standard BLUE color. For color change on tail or pilot sections, add additional $30.00 setup fee plus additional per piece color charge - contact us for additional charges. No imprint on tail, an additional $30.00 setup charge applies. An additional $90 non-refundable artwork charge must be paid before work can begin. If acceptable artwork cannot be provided, additional art charges may apply. For other Standard Imprint Color (Black, Blue PMS 300 or Green PMS 334), add $20.00 per order. For Custom Imprint Color, provide PMS # and add $85.00 per order. 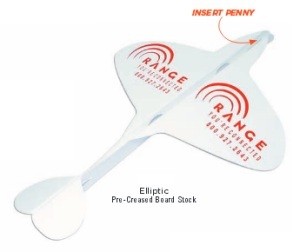 Tail surfaces and pilot figure are preprinted and remain in standard RED color. For color change on tail or pilot sections, add additional $30.00 setup fee plus additional per piece color charge - contact us for additional charges. No imprint on tail, an additional $30.00 setup charge applies. 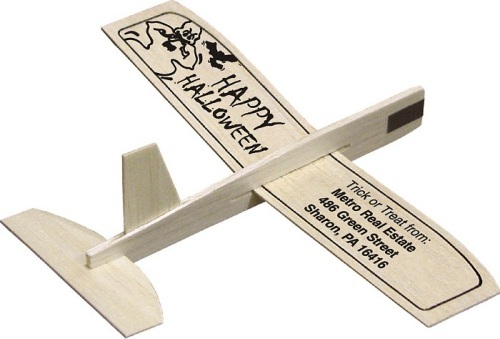 All imprinted paper airplanes are liquid laminated for a high gloss finish and printed on white cardstock. 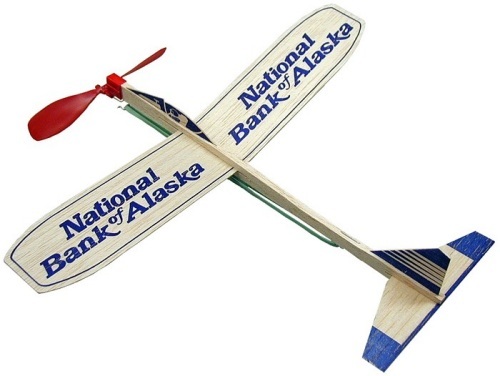 Penny paper airplanes do need a penny, or some other weight (such as a paper clip), inserted into the provided slots for flying. 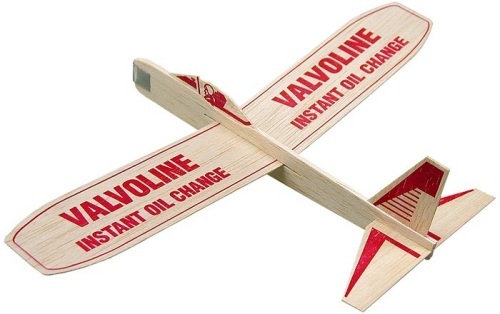 Glider Airplane - shaped in a classic, smooth flying glider form. 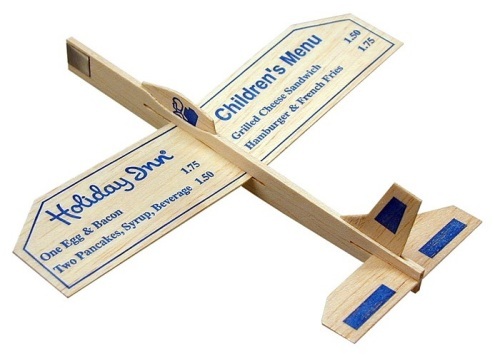 Made with 20-point sturdy paper board stock. (Shown as 1-color imprint.) 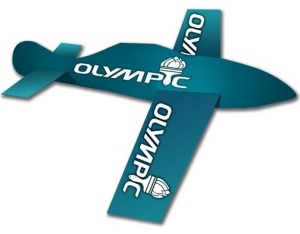 This sample shows a customized Logo imprinted on the airplane.